Tomorrow is the big day! First day of Open Studios. I’ll have some new work there, including this watercolor, which I just finished. I’ll be exhibiting with two artists this weekend in Mountain Ranch as part of Calaveras County Arts Councils Artist Studio tours. I’m working feverishly to have some new work, things you haven’t seen yet, plus I’ll have prints of old favorites, so if you get a chance, come up the hill to visit. Each artist has widely different styles, so it should be interesting to see all of them together. AnimalScapes art show opens tomorrow! 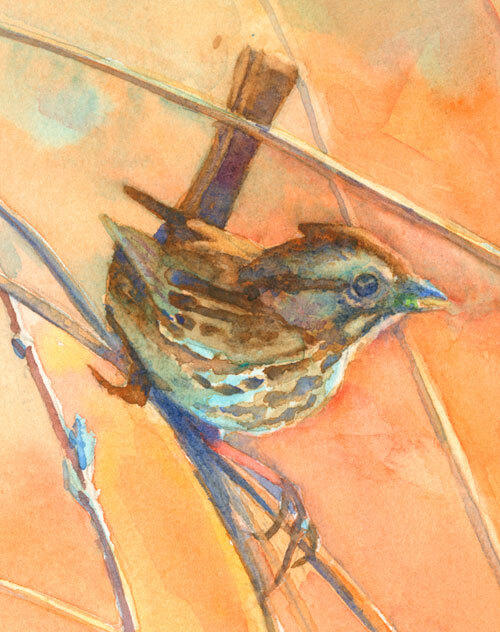 I was fortunate to be selected, along with 54 other (excellent) artists and writers, to create a painting for a show called “AnimalScapes of the Sierra Nevada Foothills.” This show was a huge undertaking for the arts councils of our tri-county area, and it was with the generosity of many donors that it happened at all. As one of the artists, I’m very grateful. Tomorrow (Saturday, January 16) is the first opening for the art show at Ironstone Winery in Murphys, California. The paintings, sculptures, and writings will be at Ironstone until February 15, then will move to Hotel Sutter in Sutter Creek (Feb. 17 – March 13), then will move once again to Black Oak Casino Hotel in Sonora (March 15 – April 3). If you are near, I hope you’ll attend, drink some wine and view (and maybe buy) some art. I think it will be worth it. A couple of the organizers voiced their hopes that this large group show might help our area heal in some small way from last summer’s nightmare Butte Fire. I hope that it might, if art can help in that way. Coming clean here: For the last couple days I’ve been painting like crazy to finish a painting for the art show Animalscapes (More about this show in another blog post). Up against the deadline? Yep. But that doesn’t mean I haven’t been painting my 30 paintings in 30 days. Just not blogging about them. Two days ago I painted the tiny study you see at the top of this post. I painted while the fiddler drove. 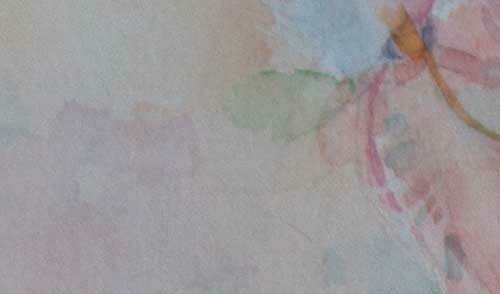 The painting is just a small block of color in my sketchbook of a photo I took at Christmas. The photo is dreadful; I think I dropped the camera and accidentally snapped the picture. But there was something about it that intrigued me. Maybe it’s the angles of the large green carpeted space. In a class taught by one of my favorite artists, Felicia Forte, I learned to look at these blurry, awkward photos in a different way. Can they be cropped to create an interesting composition? Are there interesting shape or color combinations? Is there something of use? There is something in the original photo that makes me want to keep playing with this image, and give it a bit more time. 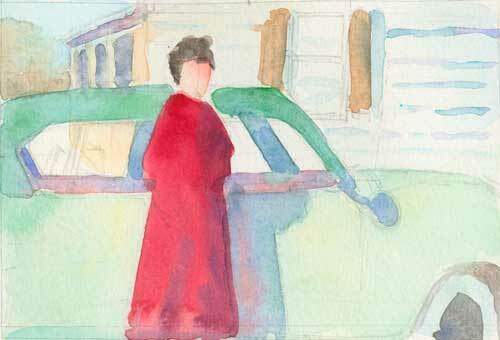 Painting a girl, a car, a road to beyond, and a Valentine’s love story. This was a commission I recently finished. 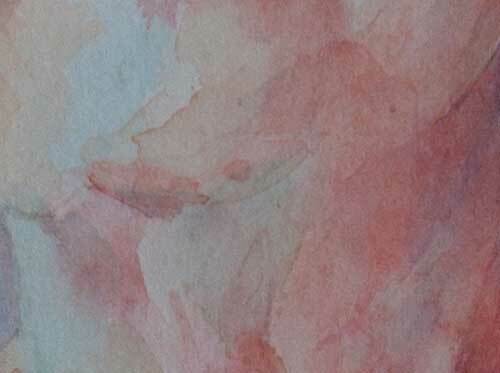 Long ago I posted about beginning a watercolor painting (You can read the post here) by making small studies to find where you want to go with the work. 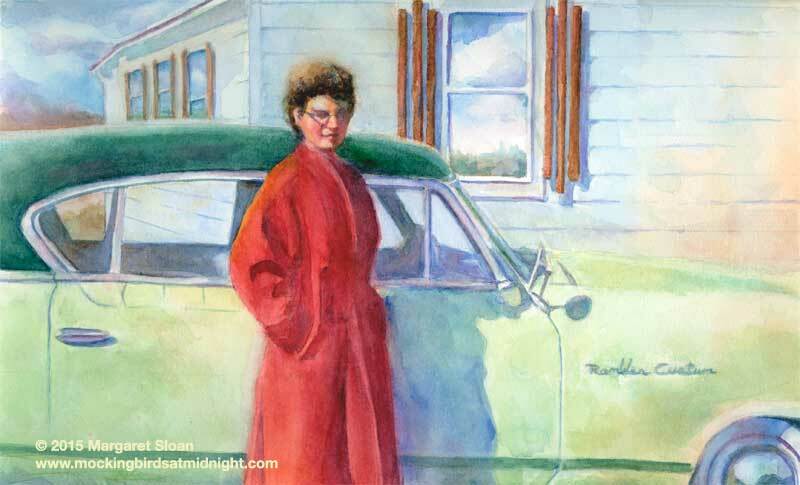 This painting was a commission from my Dad, and he wanted the house in the background; the photo was taken in my grandparent’s driveway, and my mom, my dad, and I still long for that little home in the desert where we were all so happy. But young folk have to go out on their own, and in the reflected landscape in the windows I’ve tried to capture the limitless future that all young people feel they have. The tiny black and white photo of my mom and her very first car has lived in my dad’s wallet for nearly 60 years. My parents often drift dreamily into rhapsodies about this car; I always ask, why’d you get rid of it? My mom shakes her head and says, “you know your father.” He just looks at his plate and grins. I’m awfully glad they kept each other. They are a wonderful model for a long term, romantic relationship. These are the original studies. If you’ve got an old photo you’d like interpreted with watercolor, contact me at mockingbirdatmidnight at gmail.com and we’ll talk about a commission. They make wonderful gifts and remembrances. You won’t be sorry. One of the things I learned last weekend at Silicon Valley Open Studios was that I needed more work to display. So this week I’ve been painting: Birds! I’m a portrait painter. I seriously love painting people, but the few animal paintings I had at open studios were the most popular (read: sales.) So this week I combed through my photos and painted a few birds. And you know what? It turns out I love painting birds. Who knew? Now, can anyone tell me what kind of little speckled bird this is? Today I’d like to introduce you to Cynthia Riordan, who will be exhibiting with me during the second weekend of Silicon Valley Open Studios. 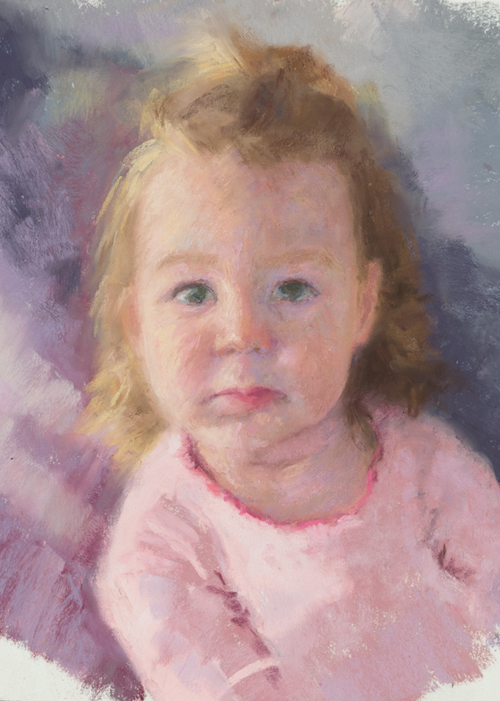 Cynthia works in oil and pastels. 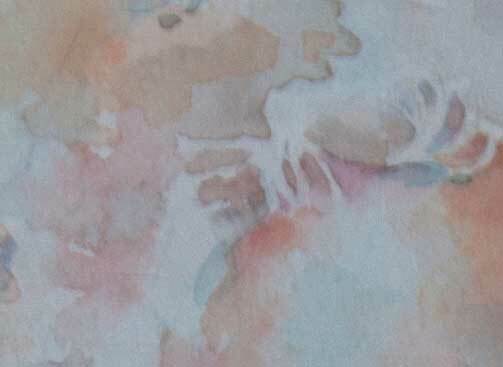 I love the softness of the lost forms in her paintings, as well as the variety of edges—hard and soft—that make her paintings come alive. Art has been important since childhood, starting with oil painting lessons when I was 12 to learn about painting still life. Early creations were giant crepe paper flowers, painting on fabric, silk screening, linoleum block prints, producing fired enamel and cloisonné objects and painting on tile. I have designed and built stained glass windows and panels for residential and commercial clients. Where has art taken you in life? Part of what I love to do is plein air painting, so that has taken me to many parks, such as Yosemite, Glacier National Park, Jackson, WY, the Tetons, Pt. Lobos. Recently, I decided to help meet the need of our country’s Goldstar families and join other artists in painting our fallen heroes from the wars in Iraq and Afghanistan. What do you think about before you begin painting? I consider both the emotional impact I want the painting to have and the technical aspects that must be considered to accomplish it. A value study or notan is something I always do. The light source and how it informs the subject is another important consideration. Tell me about one of your favorite paintings or drawings that you’ve made. Why is it your favorite? Whichever painting I am currently working on is my favorite. 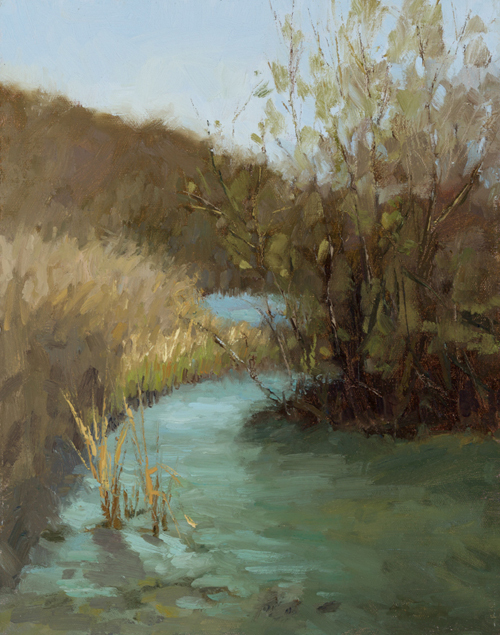 There are some plein air pieces that I am very attached to because of the memory they evoke of when and where I painted them and how I felt in the place. If you could ask one question of an artist you admire, who would it be, and what would you ask? I would like to ask J. M.W. Turner how he was able to so successfully relinquish control in his seascapes so that the viewer feels the wildness and power of the wind and the waves. Silicon Valley Open Studios in just 7 days! Hope to see you there; step up and say hello! 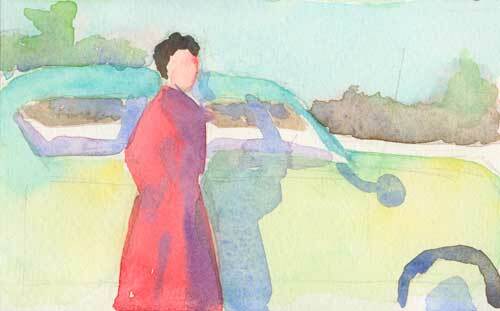 Today I’d like to introduce you to JoAnne Perez Robinson, who works in watercolor and acrylic. JoAnne’s work concentrates on things you might see everyday, and infuses them with color, form, light, and personal meaning. After you read this, get to her website and look up my favorite, Teach a Man to Fish. I have always known in my heart I was an artist but I did not have the confidence until my mid thirties to really get serious about my passion. I was doing well selling my work and doing commissions so in 2008 I decided to go to the next level and started selling my work art and craft shows. I had picked up some little miniature canvases at the art store and I thought they would sell well at festivals. They are small, affordable and all originals. 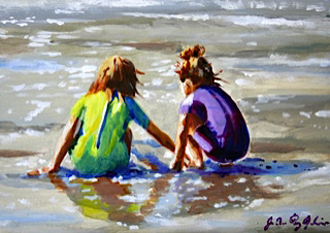 I do paint medium and large work also, but my miniature paintings have become the bread and butter of my art business. Art has been such a blessing in my life. I can honestly say I am never bored. I am always excited when I see the way light falls on an object, a dog running on the beach, a country scene or flowers in a bucket at the farmer’s market. I love to capture the sweet, everyday moments of life. To be able to stop and smell the roses, take a peaceful easy pace, slow down and really look and see the beauty that is there; this is where my art has taken me. I feel like that is a gift and I will be forever grateful for it. What do you think about when you begin painting? When I begin my painting I really like to be able to get completely lost in the scene. The feeling that the subject, colors and shapes give me is what I am trying to share with the viewer. I am more interested in getting the feeling across, than getting everything exactly perfect. I think that is what makes the art fun and draws people in; they can relate to it. They can see that there is beauty in the everyday, ordinary things that surround us all. I have lots of favorite paintings. 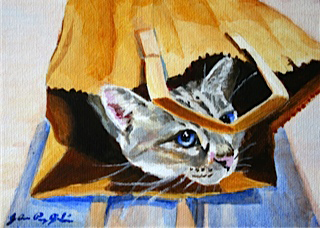 My watercolors have won 1st place twice and 2nd place twice at the Gilroy Garlic Festival. That was exciting. 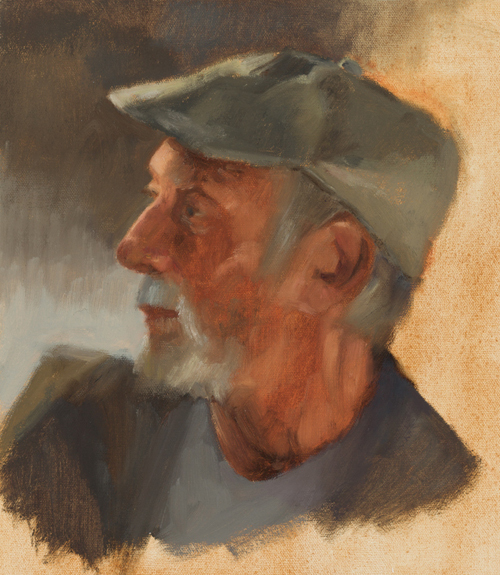 One painting I am especially proud of is Color Study. While waiting for my daughter, who got to audition for the Stanford University theatre department, I saw this scene at the Cantor museum: A lady with silvery gray hair, dressed very neutral. She was studying these paintings that were exploding with color. I knew it would make a fun painting. I ended up winning a 1st place ribbon for it and my daughter got accepted to Stanford in the fall, so I think that has to be my favorite! This is a hard one, I have too many favorite artists! 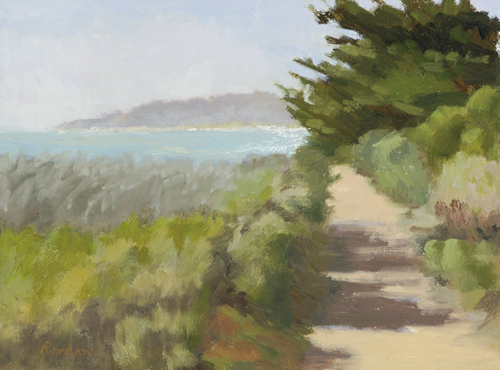 Edward Hopper, Andrew Wyeth, Dean Mitchell, Karin Jurick, Tim Horn to name just a few! I think if it can only be one it would have to be Mark Adams. He is no longer living but I wish I could have had dinner with him. His work makes me feel so peaceful. It’s so lovely. I would have asked him about how he began his watercolors, how he chose his subjects and let one question lead to the next. Last week I lived beyond cell phone and internet reach as I attended a week long workshop taught by watercolorist Ted Nuttall. As I expected, I learned so much (yes, the back of my head blew off a couple times!). Let me share just a few of the most important concepts I took away from this wonderful experience..
1. Slow down. No, I mean s-l-o-w d-o-w-n. I spent a lot of time thinking about my next brush stroke. Where should it go? What color should it be? How would it react with the other colors already on the paper? When I finally acted, it was with intention rather than panicked splashiness. 2. Think abstractly. This was probably the single most important concept I tried to internalize. I’ve been unhappy with my work lately, finding it a bit flat, and lacking the broken color and fine edges that make my head ring with internal music. By concentrating on making each small passage its own tiny abstract painting, (that of course, relates to the whole image) I was able to add interest and visual variety to otherwise flat passages. 3. Think color. I tend to get stuck in one single color: orangey-red flesh tone. But that’s not what a person looks like. Skin tones are made up of many different hues and chromas. 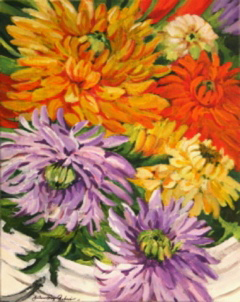 By varying color, saturation, and value, the painting is not only more exciting, but more like life. So I went (a little) crazy with color, using combinations I don’t normally choose. 4. Be uncomfortable. I made a decision that every brush stroke I put down would make me uncomfortable. 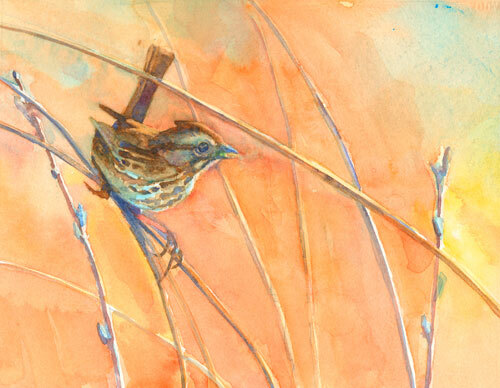 I not only walked a watercolor tight rope, but I bounced a bit on the artistic high wire. Sometimes my brushstrokes set me teetering and wheeling, but after a bit of nail biting (and whining), I regained my balance and continued painting. You know what? 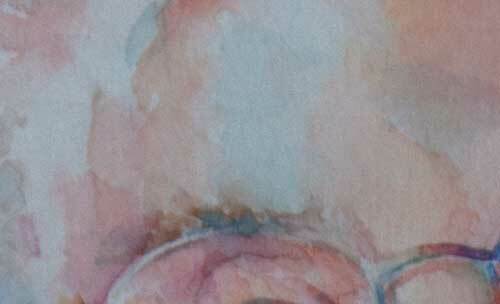 Those seemingly near disasters turned out to be the best parts of the painting. My workshop painting is still not quite finished, so I’ll not post it yet, but I’ve cropped a few of the tiny abstract paintings that make up the whole. I find them quite lovely all by themselves.